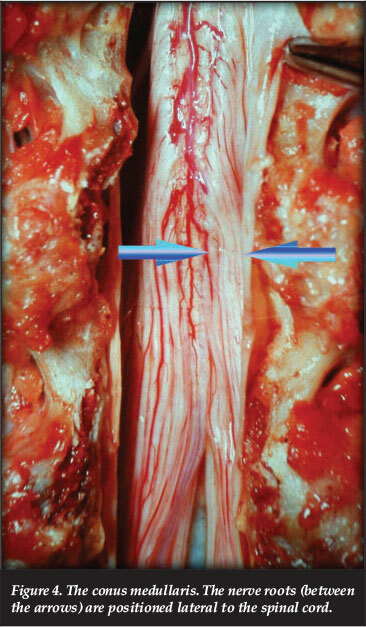 BACKGROUND: Neurogenic and referred leg pain are some of the most challenging clinical problems in spinal surgery due to the diversity of conditions that can act as aetiological factors. METHODS: The literature was reviewed and combined with case studies to demonstrate different aetiological factors. RESULTS: At least 300 conditions were identified that might cause neurogenic and referred leg pain. An aetiological classification of neurogenic and referred leg pain is presented. The classification includes systemic conditions, conditions from the brain, spinal cord, cervical and thoracic spinal canal, lumbar spinal canal, lumbar nerve root canal, lumbar extraforaminal area, the pelvis and the lower extremity. Each one of these conditions can mimic a lumbar disc herniation accurately. CONCLUSION: The aetiological classification can be used as a checklist when evaluating neurogenic and referred leg pain. Each condition deserves careful consideration and when overlooked might result in a missed diagnosis. Leg pain is a common presenting symptom of lumbar disc herniation due to neurological compression. If conservative management fails, a large number of these patients might undergo lumbar spine surgery. Magnetic resonance imaging (MRI) is considered to be the cornerstone special investigation to confirm the diagnosis of a lumbar disc herniation. 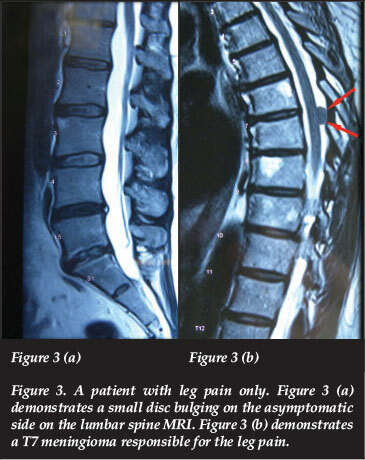 However, between 38% and 52% of asymptomatic individuals demonstrated significant lumbar disc bulging on MRI.1,2 Given the high prevalence of these findings and of back pain, the discovery by MRI of disc bulges may frequently be coincidental and the leg pain caused by an unrelated condition. It is therefore essential to consider all possible aetiological factors when evaluating leg pain. Literature reviews combined with the author's personal experience in the examination of more than 15 000 patients with back pain were used to propose an aetiological classification of conditions to consider when evaluating leg pain. A less common diabetes presentation is diabetic amyotrophy6 which has most probably a vasculitis aetiology with ischaemia followed by axonal degeneration and demyelination. 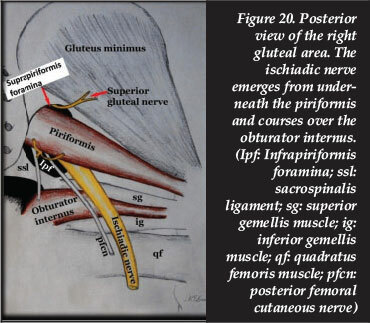 The main features are unilateral weakness, wasting and pain most commonly in the quadriceps. It spreads later to the contralateral side in an asymmetrical manner. This 53-year-old female patient presented with severe acute onset unilateral pain in the L5 nerve root distribution. 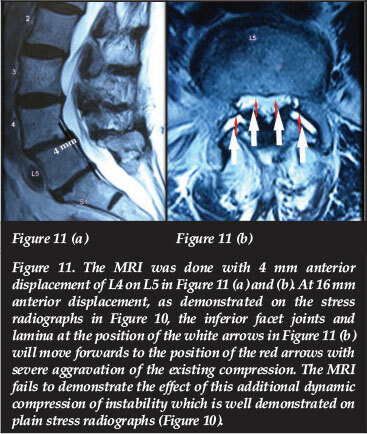 The MRI of the lumbar spine failed to demonstrate any neurological compression. 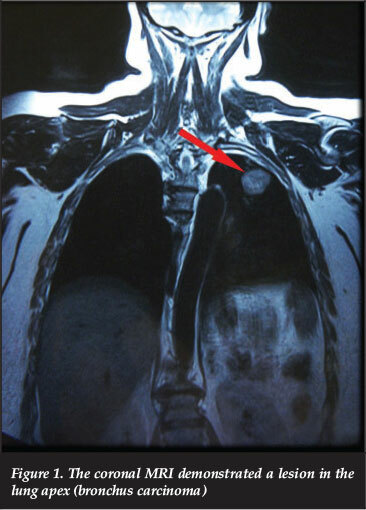 The coronal images of the MRI thoracic spine demonstrated a lesion in the lung which was biopsied and turned out to be a bronchus carcinoma (Figure 1). The antineuronal antibodies and EMG confirmed a paraneoplastic neuropathy. This 64-year-old male patient presented with severe unilateral pain in the L5 and S1 nerve root distribution 25 months after an uncomplicated L4 to S1 decompression and fusion procedure. The plain radiographs demonstrated an uncomplicated fusion and the MRI a wide decompression without neurological compression. The anti-neuronal antibodies demonstrated a positive anti-PNMA(Ma/Ta) which is associated with small cell bronchus carcinoma. This prompted a chest CT scan which demonstrated a small lesion in the apex of the right lung. A lung biopsy demonstrated a bronchus carcinoma. Vascular occlusion can mimic neurogenic claudication. The peripheral pulses should therefore be palpated in every back pain examination. Brain-related causes of leg pain include multiple sclerosis,18,19 Parkinson's disease,20 motor neurone disease,21 post-stroke pain in lenticulo-capsular haemorrhages22 and space-occupying lesions. This 57-year-old male patient presented with spontaneous onset pain in the right lower extremity 12 years after an L4 to S1 fusion, neurological decompression and instrumentation. The plain radiographs failed to demonstrate any complications and no neurological compression could be demonstrated on the MRI lumbar spine. The history of the systemic diseases revealed resection of a melanoma behind the right scapula three years before. 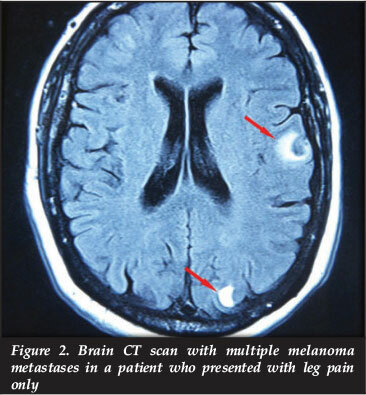 A CT scan of the brain demonstrated multiple melanoma metastases (Figure 2). This 73-year-old female patient presented with excruciating pain in the L5 distribution of the right lower extremity and was booked for an emergency laminectomy. When the patient presented for a second opinion, the MRI of the lumbar spine demonstrated a small disc bulging on the asymptomatic side. An MRI thoracic spine was requested which demonstrated a posterior situated meningioma at T7 (Figure 3) which was removed and the L5 nerve root symptoms resolved completely. 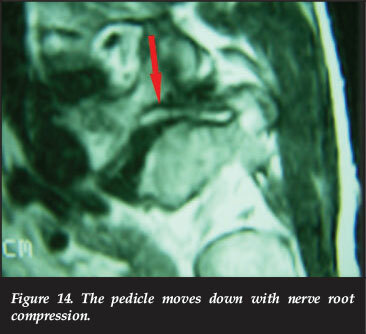 At the conus medullaris the nerve roots are positioned lateral to the spinal cord (Figure 4). 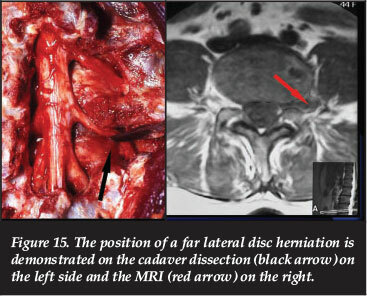 A parasagittal disc herniation or any other space-occupying lesion (for example intradural or extradural tumours, haematoma, abscess, primary bone tumours, metastases, etc.) can therefore cause compression of the nerve roots with leg pain without much compression on the spinal cord. 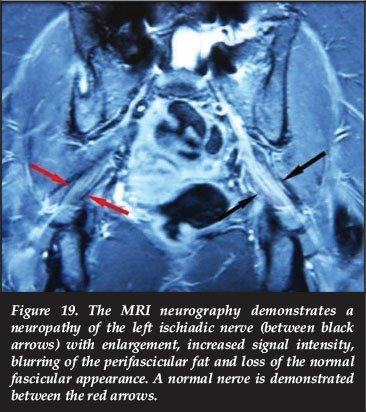 This 58-year-old male patient presented with severe pain in the right lower extremity in the L4 nerve distribution seven years after a T12 to S1 fusion and pedicle instrumentation. 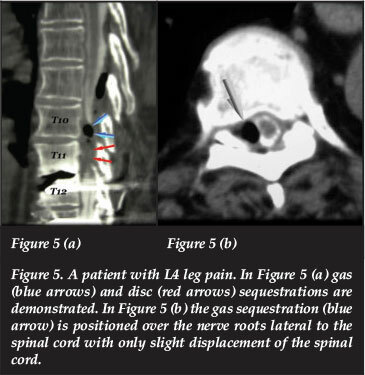 The CT myelogram demonstrated intervertebral disc and gas sequestration in the right parasagittal position with severe compression on the nerve roots but only slight displacement of the conus medullaris (Figure 5). Removal of the gas and disc sequestration alleviated the L4 symptoms completely. In facet joint syndrome, osteoarthrosis of the facet joint with a normal spinal canal and nerve root canal can give buttock and leg pain34,35(Figure 7). 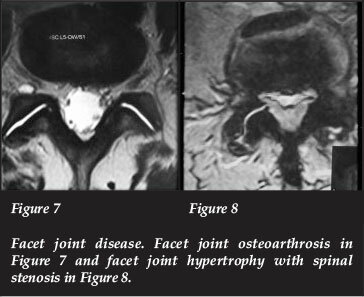 Hypertrophy of the facet joints gives spinal stenosis and leg pain (Figure 8). A facet joint cyst can compress the nerve root with leg pain. 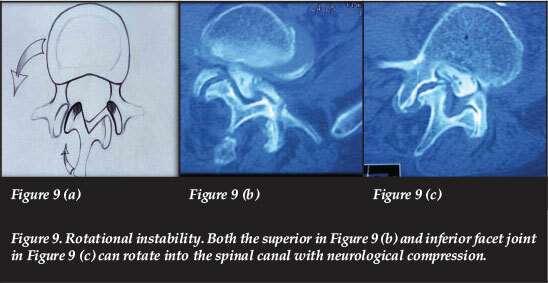 With both superior or inferior rotational instability, the facet joints may rotate into the spinal canal with neurological compression and leg pain (Figure 9). In degenerative spondylolisthesis, the vertebral body and inferior facet joints displace anteriorly. The inferior facet joints move forwards and compress the dural sac and nerve roots against the posterior aspect of the cranial vertebral body. If the flexion radiographs demonstrate superimposed instability with further anterior translation of the inferior facet joints in the flexed position, the compression on the dural sac is aggravated significantly. This dynamic compression on the dural sac is not demonstrated on the MRI and can only be appreciated on the stress radiographs (Figures 10 and 11). Any space-occupying lesion in the lumbar spinal canal can give leg pain, for example intervertebral disc herniation or sequestration, soft tissue or bone tumours, haematoma, etc. Inside the nerve root canal the facet joint might give leg pain with a combination of loss of disc height and posterior subluxation when the superior articular process moves upwards and forwards and might impinge the nerve root against the pedicle or the posterior aspect of the vertebral body, especially the inferior endplate (Figure 12). In spondylosis osteophytes from the superior facet joint or posterior inferior vertebral endplate (Figure 13) may compress the nerve root. 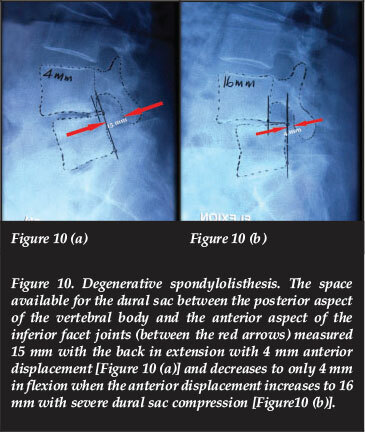 Anterior subluxation of the vertebra in degenerative spondylolisthesis might be associated with hypertrophy of the superior facet joint with extension of the superior facet joint into the nerve root canal with compression of the nerve root and resulting leg pain. In isthmic spondylolisthesis the nerve root canal is narrowed by the combination of disc bulging and pars interarticularis hypertrophy. The pedicle moves down and might compress the nerve root in complete loss of disc height in combination with spondylolisthesis (Figure 14) and degenerative scoliosis. Intervertebral disc herniation into the nerve root canal is the most common cause of nerve root canal narrowing and neurological compression. A far lateral disc herniation may compress the nerve root after it has left the nerve root canal (Figure 15). The corporotransverse ligament extends from the vertebral body to the transverse process of the same vertebra.45 It may entrap the nerve root in rotatory subluxation in combination with complete disc space narrowing. 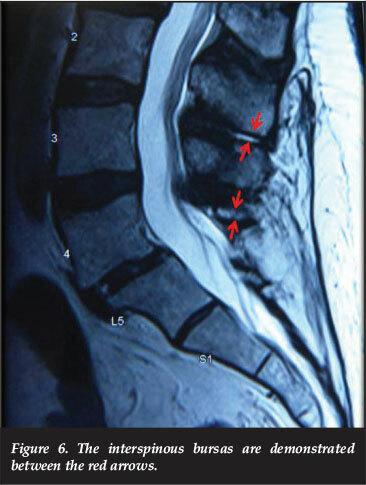 In spondylolisthesis with severe disc space narrowing, the L5 nerve root may be impinged between the L5 transverse process and the ala of the sacrum (Figure 14). This may also occur in degenerative scoliosis with tilting of L5 and depression of the concave L5 transverse process (Figure 16). 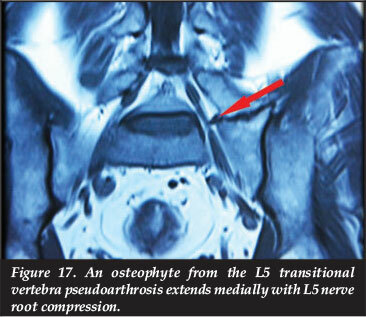 At the entrance to the pelvis, a large osteophyte from the L5 transitional vertebra pseudoarthrosis might compress the L5 nerve root (Figure 17). 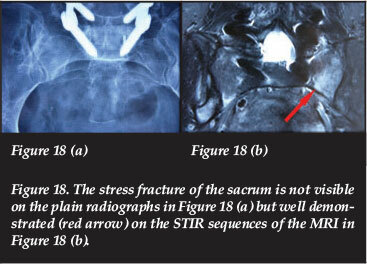 A stress fracture of the sacrum can give back, buttock, groin and thigh pain.48 It may also give direct compression or a neuropathy of the nerve root.49 The most common associated stress fracture is that of the ipsilateral, contralateral or both pubic rami.50 It may remain undetected on plain radiographs for months but readily demonstrated on the STIR and T2 weighted MRI images (Figure 18).51 MRI alone identifies 99, 2% of stress fractures compared to 69% with the CT scan alone.51 The MRI remains the investigation of choice in these cases. A lumbosacral radiculoplexus neuropathy presents with asymmetrical lower limb pain, weakness, atrophy and paraesthesia.56 It can be caused by diabetic lumbosacral radiculoplexus neuropathy, non-diabetic lumbosacral radiculoplexus neuropathy, chronic inflammatory demyelinating polyneuropathy, connective tissue disease, Lyme disease, sarcoidosis, HIV and cytomegalovirus-related polyradiculopathy.56,57 The typical MRI neurography findings (Figure 19) are increased signal intensity and enlargement of the nerve and blurring of the perifas-cicular fat on the T2 weighted neurography sequences58-55 (long echo times, radiofrequency saturation pulses tosuppress signals from adjacent vessels and frequency-selective fat suppression).60,61 EMG, fasting blood glucose levels, sedimentation rate, rheumatoid factor, antinuclear antibodies, antineutrophil cytoplasmic antibodies, extractable nuclear antigen, HIV,56 serum antibodies associated with neurological disorders (antineuronal, antiganglioside and anti-astrocyte antibodies)62 and CSF evaluation are some of the special investigations of diagnostic value. 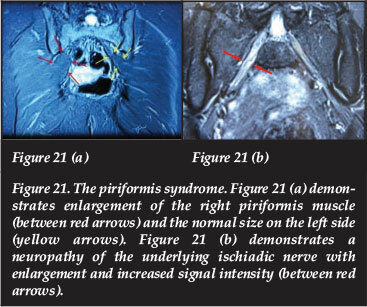 In the piriformis muscle syndrome hypertrophy, spasm, contracture or inflammation of the piriformis muscle may compress the ischiadic nerve with pain in any part of the ischiadic nerve distribution (Figure 20). This 55-year-old male patient presented with the clinical triad of superior gluteal nerve entrapment. 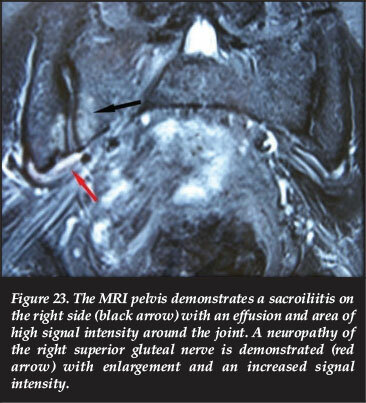 The MRI pelvis demonstrated sacroiliitis on the right side with an effusion and a neuropathy of the superior gluteal nerve with enlargement and an increased signal intensity (Figure 23). There are special considerations in female patients regarding leg pain which deserve mentioning. Sciatica in pregnancy can be caused by direct compression of the gravid uterus on the lumbosacral plexus and blood vessels.80,81 Incorrectly positioned leg stirrups on the obstetrical table can cause common peroneal nerve pain and weakness.80,82 Obstetric neuropathy of the sciatic nerve during vaginal labour can be caused by continuous pressure of the foetus on the lumbosacral plexus as it crosses the pelvic brim during prolonged labour.83 Piriformis syndrome can be caused during labour following a piriformis haematoma after prolonged labour, and a piriformis abscess after epidural anaesthesia and forceps delivery.84 Sciatica secondary to pathological conditions80 include leiomyomas with lumbosacral plexus compression,85 endometriosis with infiltration or compression of the sciatic nerve86 and a large retroverted uterus with compression on the lumbosacral plexus.80 Sciatica secondary to iatrogenic trauma includes vaginal procedures which might be complicated by ischiadic neuropathy,87 superior gluteal artery aneurysm with superior gluteal nerve compression and the superior gluteal nerve neuropathy due to stretching of the superior gluteal nerve. This 29-year-old female patient presented after two years of diligent conservative treatment for a small L5/S1 disc bulging with progressive deterioration of buttock and leg pain. 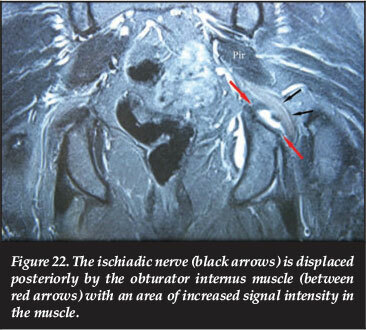 The MRI pelvis demonstrated a large ovarian cyst which displaced a large uterus lateral and posterior with an underlying large piriformis muscle, and an increased signal intensity and enlargement of the ischiadic nerve (Figure 24). Greater trochanter bursitis and gluteus medius tendinitis remain some of the most common causes of leg pain in patients above 60 years of age. A stress fracture of the femur neck, intertrochanteric area and the proximal femur presents with pain in the groin and anterior aspect of the proximal thigh. Plain radiographs may remain normal for a considerable time. An MRI and bone scan are useful in the early stages to confirm the diagnosis. Iliopsoas88 and iliopectineal89 bursitis and synovitis present with pain in the groin and anterior aspect of the proximal thigh. They might also give femoral nerve palsy and pain. Leg pain may also be caused by myositis or myopathy. Palpation of the muscle may reveal local tenderness which is more pronounced than what would be expected of neurological compression, swelling and oedema, atrophy or hypertrophy and overlying skin changes. At least 300 conditions were identified that might cause neurogenic and referred leg pain. Table I is presented as an aetiological classification for neurogenic and referred leg pain and can serve as a checklist to ascertain that all appropriate conditions are evaluated. Each one of these conditions deserves careful consideration and if overlooked might result in a missed diagnosis or even the disaster of the creation of yet another failed back. Our treatment can only be as good as our diagnosis. If the diagnosis is missed, the treatment will obviously fail. The content of this article is the sole work of the authors, and no benefit of any form has been received or will be received from any commercial party.